Most of the world's population now lives in cities. So if we are to address the problems of environmental deterioration and peak oil adequately, the city has to be a major focus of attention. Ecocities is about re-building cities and towns based on ecological principles for the long term sustainability, cultural vitality and health of the Earth's biosphere. Unique in the literature is the book's insight that the form of the city really matters - and that it is within our ability to change it, and crucial that we do. Further, that the ecocity within its bioregion is comprehensible and do-able, and can produce a healthy and potentially happy future. Ecocities describes the place of the city in evolution, nature and history. It pays special attention to the key question of accessibility and transportation, and outlines design principles for the ecocity. The reader is encouraged to plunge in to its economics and politics: the kinds of businesses, planning and leadership required. The book then outlines the tools by which a gradual transition to the ecocity could be accomplished. Throughout, this new edition is generously illustrated with the author's own inspired visions of what such rebuilt cities might actually look like. Richard Register is one of the world's great theorists and authors in ecological city design and planning. The founder of Urban Ecology and Ecocity Builders, he convened the first International Ecocity Conference in 1990, lectures around the world, and has authored two previous books, as well as an earlier edition of Ecocities. Richard Register is one of the world's great theorists and authors in ecological city design and planning. 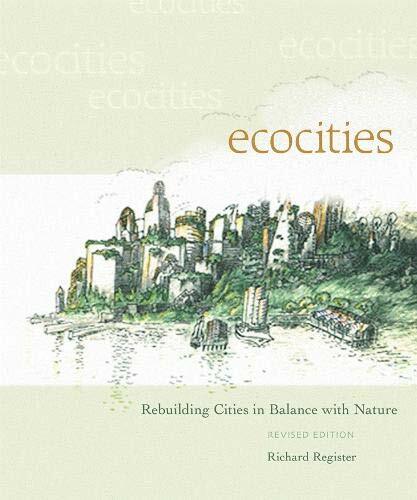 The founder of Urban Ecology and Ecocity Builders, he convened the first International Ecocity Conference in 1990, lectures around the world, and has authored two previous books as well as an earlier edition of Ecocities (Berkeley Hills Press, 2002).